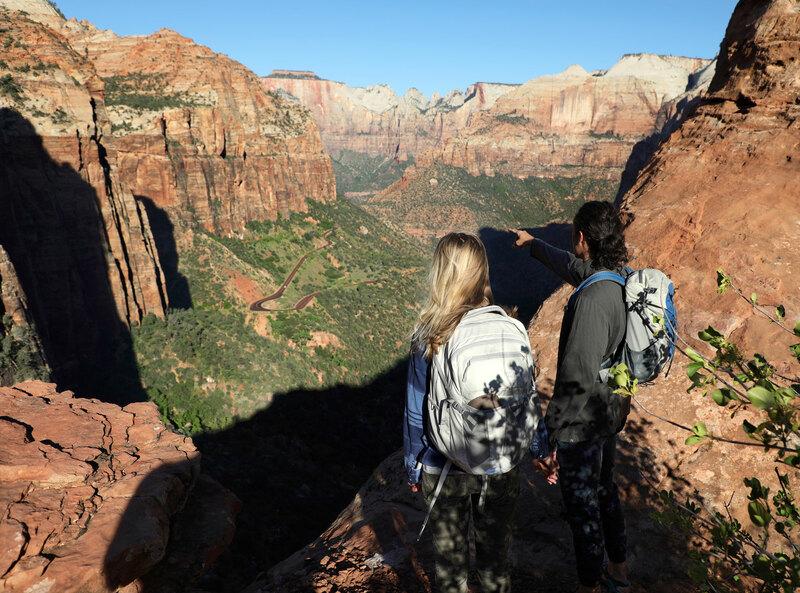 Zion has drawn a growing number of trekkers, backpackers, rock climbers and cyclists seeking a deluxe outdoor vacation experience. From active day trips that challenge and inspire to weekend athletic clinics to empower your team or forge a family bond, there is a bounty of outdoor activities that will challenge and delight outdoor adventure seekers in Zion National Park. The Narrows – This is easily the most popular hike for teams and families. Whether you are looking to challenge yourself or enjoy a meandering morning hike with a group, the Narrows can appease your needs. The hike can be tailored to any ability, which makes it ideal for groups of varying skill levels looking for an exciting outdoor adventure. Once you’ve maneuvered through this beautiful trail, ramp up your outdoor experience with a stay at one of the luxury log-cabin vacation homes. Sink into a log-frame bed in a sprawling cabin built for 20 and enjoy the luxuries of a five-star resort while continuing to be surrounded by the quiet beauty of Zion National Park. Our vacation homes are four and five star quality. Our recreation offerings are the best as well. 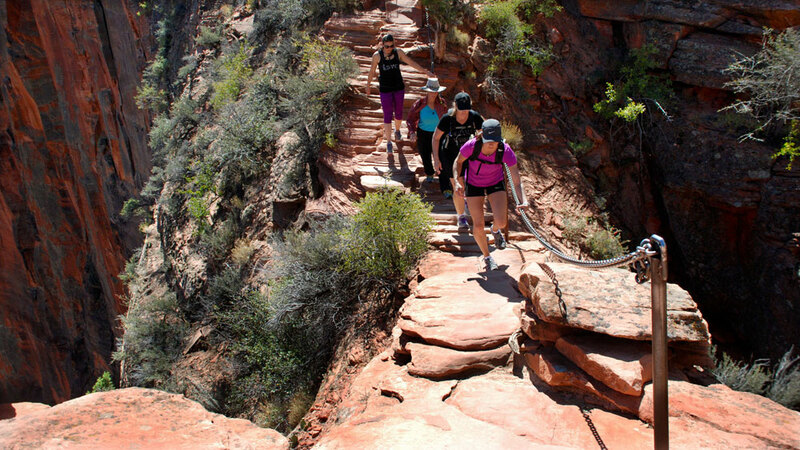 Angels Landing Summit– With its dramatic view, this hot spot is a hiker’s and climber’s dream destination. To get to the summit of Angels Landing, hikers begin at the Grotto Trailhead and wind their way through the shady and cool Refrigerator Canyon before tackling Walter’s Wiggles. 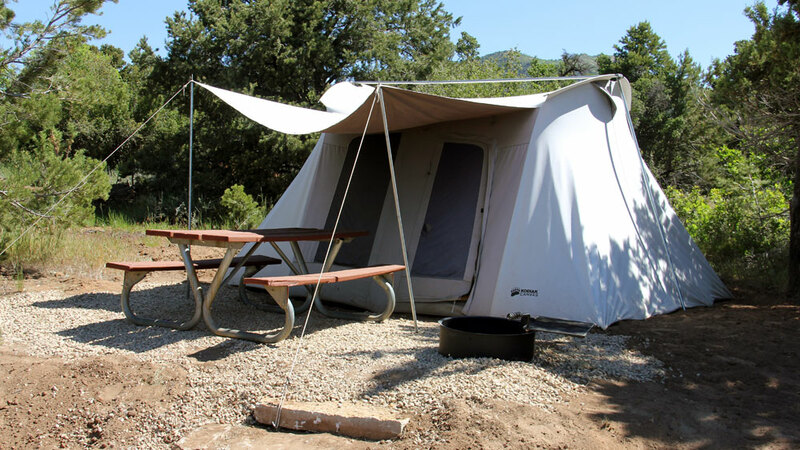 Flip the script on the typical outdoor get away and find yourself in the middle of nowhere with an attentive concierge when you stay at one of the glamping tents. Slumber comfortably under the billowing white tent canopy on a roomy bed swathed in luxurious sheets and plump pillows. Room service is just a call away. Feast on a complimentary ranch breakfast before taking to the sandstone cliffs of Zion. Pa’rus Trail – Bicyclists can meander along the lower part of the park and take in 250 million years of prehistoric rock formations, rolling meadows and the Virgin River. Shuttles take bikers to the top of Zion Canyon where they can zip down along the Scenic Drive and take in the broad meadows lush with wildflowers in the spring and fall that line the Pa’rus Trail. Pack up the RV, or rent one, with all of your gear and stay in enjoy a stunning and spacious slot at the Zion Ponderosa Ranch Resort RV park. Each space has a grill, picnic table, wireless internet, laundry facilities and access to the resort’s open use activities such as the pool. 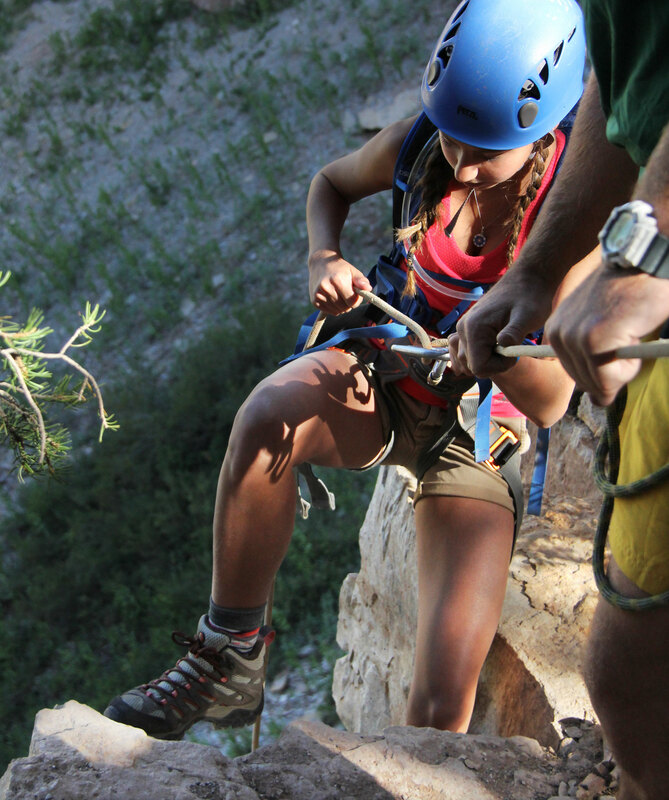 Climbing Zion – Whether you are new to climbing or are a seasoned professional, there is a stunning rock face for you in the canyons and cliffs of Zion. The walk along The Narrows and to Scout Lookout is ideal for those who are in good condition but have limited climbing experience. Most of the world-renowned big wall climbs in Zion, such as Angel’s Landing, Streaked Wall, and Mount Isaac, are for experienced climbers. After a long day of climbing and hiking, check into one of the roomy log cabin suites nestled in the foothills and ponderosa pines of Zion. Perfect for friends or families, the cozy cabin suites come with plush furnishings, comfy beds and full kitchens. A complimentary breakfast and a variety of amenities are included. 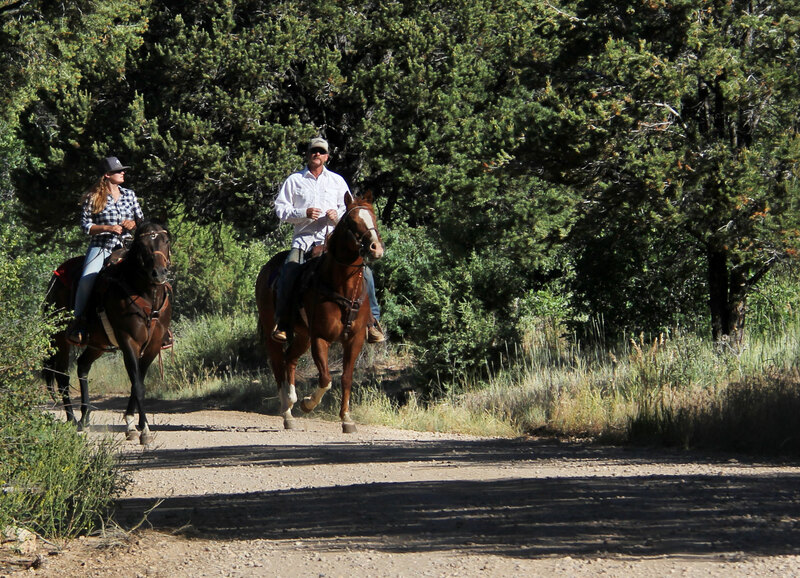 Horseback Riding – Saddle up on a specially trained steed for a scenic tour of Zion that carries you from the canyon floor up to sweeping vistas. Create a full-rounded and authentic outdoor adventure experience and book a covered Conestoga wagon that can sleep up to 6. The covered wagons are modeled after 19th century wooden wagons and are stocked with all of the modern comforts. Each wagon has a king bed, two sets of bunk beds and is equipped with electricity, Wi-Fi, access to open use activities and laundry area and includes breakfast.